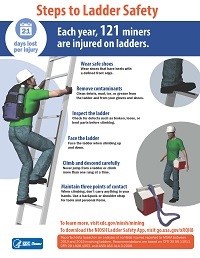 Many miners use ladders daily, and over 120 miners are injured each year due to ladders. The National Institute for Occupational Safety and Health (NIOSH) analyzed Mine Safety and Health Administration non-fatal injury data involving ladders to determine the impact of these injuries. These results along with a review of Occupational Safety and Health Administration and American National Standards Institute (ANSI) standards yielded a few simple steps that miners should take when using ladders. The following infographic outlines these steps to ladder safety. Read more about NIOSH research on preventing slips, trips, and falls in the workplace. Get the NIOSH Ladder Safety App to help use ladders safely. Download an infographic that presents the six steps workers can take to safely use a ladder.